Mark introduced me to Dale's work and mentioned the idea of a profile to him at last year's AAW Symposium. 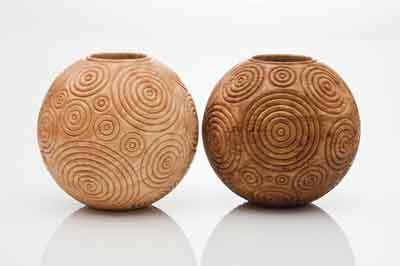 I was stunned by his bowl forms, the beauty in each one he produces, the beautiful timbers that he uses as well as the ethos behind the work he creates. It was with excitement that I started researching and finding out about more Dale's interesting background. Dale was born in North Dakota where he was brought up on a farm as the son of a beef farmer. "To give you an idea about what it is like on the plains of North Dakota, my father wore a World War II high altitude bomber's insulated wool suit when farming," he tells me. As a child, Dale remembers walking along the Missouri river and the freedom he felt back then as well as how cold it was. Last year Dale attended the Dakota Woodturning symposium in Bismarck, North Dakota, to represent the AAW, and comments on how good it was to see his old home ground once more. Dale tells me how he first saw a lathe when he was a senior in college, back in 1973. "I took a woodworking class and the instructor said we were going to make three projects that semester as well as turning something on one of the lathes that sat in the corner of the room. That was about as much instruction as we received." Dale took to turning straight away by buying pieces of black walnut, which he cut in two and glued into a 100 x 255 x 255mm (4 x 10 x 10in) block. "I turned a closed form bowl using scraping tools, then I spent a great deal of time sanding out all the tear out and finished it by gluing a piece of green felt on the bottom. I gave it to my college girlfriend," he says. After leaving college, Dale worked in a few different places until, a few years later, he ended up in Alaska in the summer of 1978. "The old timer I was staying with had an old lathe out in his shop, so I asked if I could play with it. He said, "yes" and we cleaned all the junk that was sitting on it. He pulled some old wood out he had bought 20 years earlier, to make a salad bowl set for his wife, but he never did." Dale scraped a 100 x 280mm (4 x 11in) bowl together with a matching set of eight smaller bowls for him. "The spark had started," Dale remembers. When Dale came back south to Washington that autumn, he found himself purchasing a $212 round bed Sears lathe and a set of 12 turning tools. "I was in the woodturning business," he tells me. The set of tools were mostly scrapers and two spindle gouges, but for the next 11 years, Dale turned a lot of bowls from dry wood, scraping them round and sanding. "It took me four hours to turn a 100 x 280mm (4 x 10in) bowl round, and four hours of sanding, starting with 50 grit garnet to remove all the tear out." Dale glued up the big bowls from dry 50 x 150mm (2 x 6in) blanks because, at this stage, he didn't know that turning wet wood was possible. But he was soon to find out. 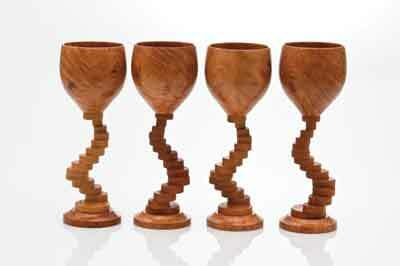 In 1989, Dale came across an advertisement in a woodworking magazine informing him of a group of woodturners getting together in Seattle. "I sent my money in and went to the third symposium for The American Association of Woodturners (AAW). It was a lot smaller then; I think the tool show had three booths." Dale particularly remembers walking into the Instant Gallery and seeing Frank Cummings's small turned goblets inlaid with gold, ivory and other precious materials. "At the time, in 1989, they were priced from $1,500-$3,500. All were marked sold." He also remembers seeing Ron Fleming's 'Lilly' piece. "I realised there was something in the world besides bowls with flat bottoms scraped round." That next spring, Dennis Steward and 24 other woodturners started the Cascade Woodturners in Portland, Oregon. "I have been President twice and continue to host the Open Shop day on the last Saturday of each month I'm home," he tells me. In 1991, Dale started selling his bowls in a small gallery in the Columbia River Gorge area, after which time, he got into the Contemporary Crafts Gallery. "It was the best thing I could have done to improve my work. If you make something and give it to a family member or a friend, they are going to say, "thanks, it's beautiful!" But you really don't know if it is good. Putting my work up on a shelf, or putting a bowl in an auction, takes some guts, as people may reject your work," says Dale. Between 1992 and 1993, Dale applied to have his bowls exhibited in the Real Mother Goose Gallery in Portland, but unfortunately the gallery jury decided to reject his bowls, asking Dale to bring them back in a few years' time after he had worked on the form a little more. "So, in 1995, I applied again. I told them I turned salad bowls. They told me they had a lot of turned work but it didn't sell much, but that they didn't have any wood bowls and they had customers asking for them. They juried my work again and I got in." This gallery, according to Dale, is a wonderful gallery, and at this stage, he really felt like he had found a niche in the market. Three other galleries followed: Appalachian Spring Gallery in Washington DC area in 1999; Northwest Fine Woodworking in 2003 and The Wood Gallery in 2005. Dale describes himself as a bowl turner, predominantly, turning bowls from locally grown wood. "I work with several indigenous species like bigleaf maple, Pacific madrone, cherry, and to a lesser extent, myrtle, Oregon white ash and Oregon white oak." He also works some planted species such as black walnut, English walnut and apple. "I rarely buy bowl blanks someone else has cut. The bowl starts in the tree, and if someone else cuts the blank out of the tree, they have made the most important artistic decisions about that bowl. I want to cut the blank out of the tree. My bowl is not a collaborative piece; my name is on the bottom," he tells me. Most of the timber Dale uses comes from trees in the Metro area where he lives, being felled because of construction, or have died. "The Pacific madrone burl and myrtle comes from southern Oregon 4-6 hours south of Portland. I don't turn much myrtle because the wood is full of silica and dulls the tool. It is somewhat brittle and the side-grain likes to tear out as I turn it." Dale says that madrone is the nicest wood in the world to turn, as it is a moderately heavy dense wood with a beautiful colour. 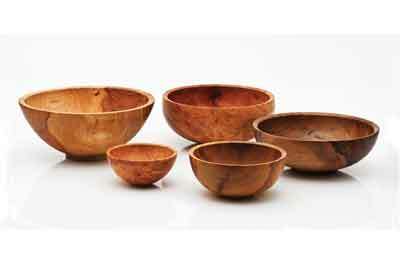 Dale likes symmetrical bowls and talks about the boiling of Pacific madrone and how this process releases the stress in the wood, letting the timber dry successfully. "It is the method I still use for working with green madrone." Dale is inspired by the fact that the woodturning community is so generous: "Every turner I know will take the time to explain exactly how they make something, even if it is how they make their living. No other art form that I know of will share their trade secrets so openly. Woodturning has been the balance in my life, reminding me every day that most of the world is made up of decent, generous people." 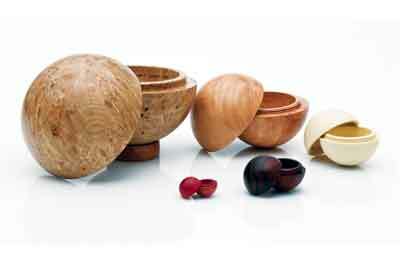 Dale is fortunate enough that he doesn't have to make a living from woodturning; he can turn when and what he wants. "I have been turning for 31 years now, and I try to make each bowl better than the last. I am still learning how to turn; I never miss an opportunity to watch another bowl turner demonstrate. As Richard Raffan said, "Always make the last cut, because if you don't push your limits, you'll never get better."" Dale's workshop measures 28 x 44ft, a cheaply built building which currently houses seven lathes. "I do all my roughing out and spindle work on my Oneway 2036 and do all my finishing work on a custom built DJ bowl lathe, designed by Denver Ulery," Dale tells me. Within his fully-equipped workshop, he also has a second Oneway, a 1640, two Jet mini lathes for classes, and two Carbatec lathes that he uses for small items and threading boxes. In terms of aspirations for the future, Dale tells me how he hopes he can be an ambassador for woodturning as he travels around the world. "As Clay Foster told me once, he doesn't make a living from woodturning, he lives on what he makes woodturning. Clay says that woodturning is a good path in life, where one can surround themselves with wonderful people and nice art." Dale also explains how he would like to do more teaching in the future, but he is somewhat limited, as he doesn't really like to travel. "I want to share what others have taken the time to share with me. I hope that in 30 years'time, I'll be like my friend, Wally Dickerman, who is now 88 and at the peak of his artistic career doing the best work of his life." 1. Learn to give wood away. Keep the best and give the rest away. It will save room in your shop for more good wood. You are never going to turn that junk wood that has been sitting in your shop for 20 years. 2. Always go to look at wood when it is offered for free; you do not have to take it, but look at it. It may be good wood.